For the past few months, Todoist has been my task manager of choice. I’ve invested a lot of time in tweaking it to find a setup I’m happy with. This is the first post in a mini series I’ll be doing on Todoist. First, I wanted to share my custom start page. 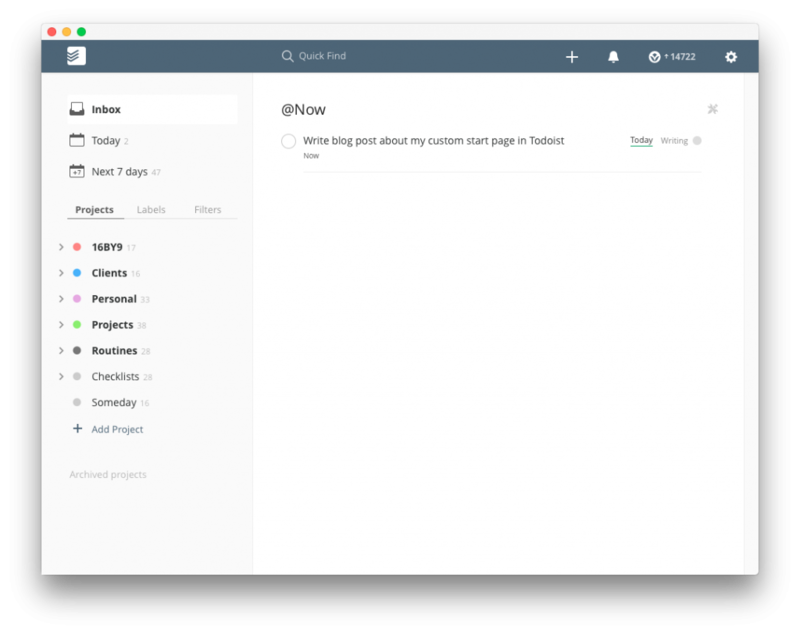 In Todoist, the start page is what you see when you click on the logo in the top left corner. You can customise what appears on this page by going to Settings and selecting from the “start page” drop down. I started by using complex queries to show my various priorities and projects and labels. But honestly, I didn’t find that particularly useful. Now I’ve opted for an incredibly simple start page and I use it multiple times a day. This is a problem when you have a large degree of autonomy with your time. You can work on what you want, when you want. But jumping around tasks like this is hugely inefficient. Now, when I lose track of what I’m working on, I jump straight to the start page which shows me the task I was working on. Once that task is done, I check it off, find another task to work on, add the @Now label, and off I go. I’m not sure if this is useful to anyone else but it seems to work for me.